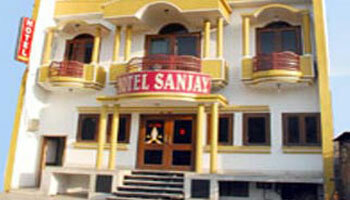 Hotel Sanjay is the one of the best budget Hotel in the city of love, Agra. It is excellently situated for tourist and very close to all ,major attractions including banks, Shopping Malls, Restaurants Airport, Railway station & Bus Stand. In the Hotel all rooms are private & attached bath, Telephone & Colored T.V. with multi channel. Our motto is to provide good quality accommodation and tourist services to visitor's who stay in our Hotel. Room Service, Airport Transportation, Currency Exchange, Doctor on Call, Travel Counter, Breakfast Services, Laundry Facilities, Security Guard, Parking, Backup Generator. Iron/Ironing Board, Attached Bathroom, DVD Player, Toothbrush/Razor on Request, H/C Water, Air Conditioning Room, Wakeup Calls, Cable/Satellite TV, House Keeping.